Sweden – Gray Design (GRAY) announced today with Ronn Motor Group (RMG) that they will bring a unique offering of integrated super performance hyper cars with a performance super yacht to the luxury market. 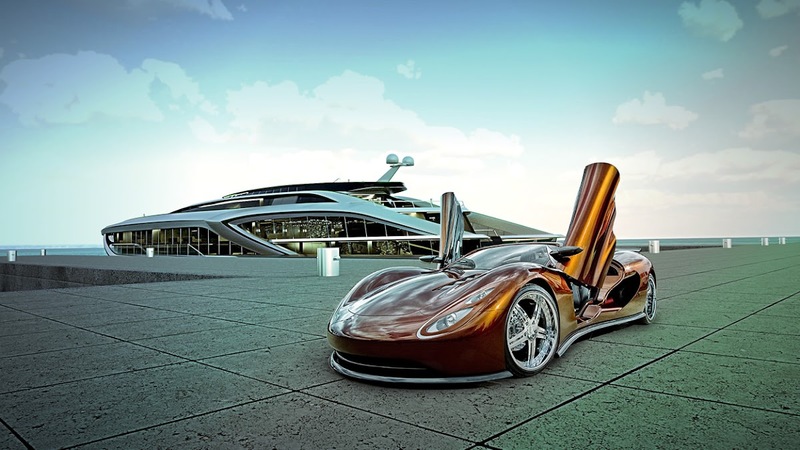 “We are excited about forming this alliance with Ronn Motor Group (RMG) to complete the experience for our customers with being able to segue from the super yacht on sea to hyper car on land,” said Eduard Gray, CEO of Gray Design/Zeus Twelve. The GRAY super yacht is the Fairwei that is designed to cater to the obsessive desires and provides an environment of leisure and harmony to rejuvenate it’s passengers. The Fairwei draws parallels to the game of golf where players pursue greater levels of perfection, refinement and experience. It therefore has appointments of pleasant green areas to create an enhanced environment of relaxation, a tee off point to practice drives above the flydeck, while the deck at the side and aft have chipping and putting greens to work on the short game. The interior has been kept minimalistic and uses simplistic colour schemes together with crystal embellishments to add a touch of the ethereal. An indoor swimming pool and spa division create the perfect calm for unwinding and feeling refreshed. “The Fairwei is perfect partner for our soon to be announced exclusive 2017 RMG “ Bird of Prey,” “The Hyper Hybrid’s” final design will be developed with Gray Design and is perfectly aligned with the Fairwei to provide a continuum of high performance experience for the customer from sea to land and back to sea” says Ronn Maxwell, CEO of RMC. The RMG’s tentative development name “Bird of Prey is an all-wheel drive hyper-hybrid producing a massive 1,200 plus horsepower with Formula One electric drive technology and performance and one of kind ultra-exclusivity. The automobile, reflecting the beauty of Ronn’s first offering the “Scorpion” will be a limited edition, exclusive offering, providing the latest technologies and designs to operate in the same rarified space as Pagani, and Koenigsegg as an integrated compliment to the Fairwei with first delivery scheduled for 2017. Announcements coming soon!! The companies report that there will be limited release of the Fairwei and Bird of Prey set with an estimated cap of seven to maintain the exclusive nature of this offering.